In Spring 2008, Lucy Haagen, Visiting Lecturer in the Program in Education, used mobile phones to develop learning communities connecting Duke students with Durham high school students and mobile-learning resources. Haagen and the students used mobile phones both as traditional devices (i.e., as phones) and as capturing (for example, to record audio essays) and advanced communication (podcast broadcasting) devices. Based on the initial success of this program, CIT provided resources for Haagen to use mobile phones to facilitate ESL service-learning activities with DukeEngage in Vietnam during Summer 2008. Using the multimedia capabilities of the phones, Duke students used mobile phones as communication, documentation and instructional tools to enhance their work as English teachers in two villages outside Hanoi. Haagen’s project used Nokia N 72 handsets. Many mobile phone brands can be purchases as ‘unlocked’ and/or ‘international’ – meaning they’re not tied to specific carrier, and can be used in foreign countries by purchasing a ‘pay as you go’ SIM card after arriving in the destination country. In contrast to the US, where calls and text messages are most often charged to both callers and receivers, receivers of calls and text messages are not charged in Vietnam and many other Asian countries. 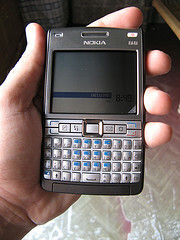 Increasingly, even affordable mobile phones are equipped with cameras (still and video), voice recorders and messaging systems that don’t require internet connectivity. Multimedia-capable phones often include cameras that can take photos or even capture video. Built-in microphones can capture and record audio as well. Depending on the type of phone, these files can be shared between phones or downloaded onto a computer later. Some phones even include software for editing audio and video within the device itself. For ESL activities, audio/video recording is especially helpful, as students can record themselves trying phrases, and immediately listen to and/or view the results. In Haagen’s proejct, for example, one student created an audio diary by recording messages to a close friend. Other students used the mobile phones’ cameras along with audio narration to document various aspects of the culture. Mobile phones that are enabled to send and receive text messages can be used to communicate between smaller groups to arrange meetings, or even accept answers to short quiz questions. The cost of text messaging (SMS) in many foreign countries is far less than the cost of messaging in the US. Faculty Director on the Vietnam project, Erik Harms, used text messaging on a week-long field trip where students were trusted to explore on their own as long as they met up at appointed times and places. Program Assistant Duc Ho used text messaging to run an ad-hoc “admissions office” for one of the projects involving a 3-week English class for gifted high school students. Faced with more applicants than available spaces, Duc used text messaging to manage a waiting list and communicate with applicants as information became available. Throughout rural Vietnam, electricity is rationed. In summer, electricity rations (about 10 hours/day) are reserved for lighting and for running electrical fans at night – crucial to sleeping in a tropical climate without air conditioning. With power in such short supply, mobile phones took the place of laptops as presentation tools. English lessons were enhanced as small groups of students crowded around the instructor’s mobile phone, viewing pictures and listening to downloaded American songs and podcasts. Haagen used her mobile phone to capture images, video and audio connected with English teaching in Hanoi and the two villages. With assistance from staff in Hanoi University’s new media lab (a gift from the New School (NY, NY), she used Apple i-DVD to create interactive DVDs. These DVDs were then used in a series of teacher workshops funded by the US Embassy in Hanoi.